Kangana Ranaut and Manikarnika Team had a blast while celebrating teaser launch! Kangana Ranaut and her team seem to be having a blast after their successful launch of their Manikarnika’s teaser. From the actor’s official Instagram account, we can see pictures and videos, of the team celebrating. 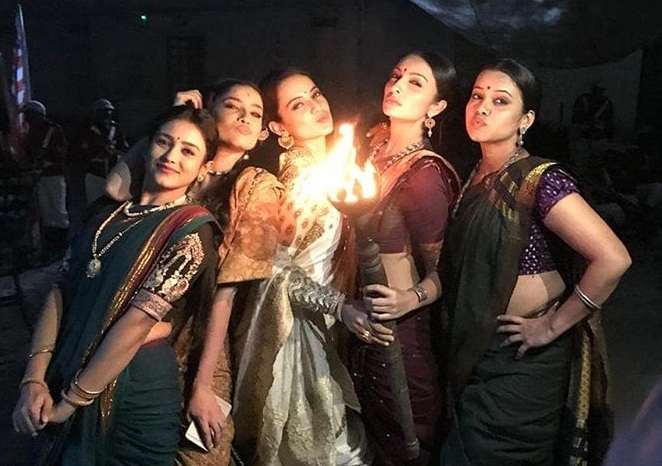 A boomerang video shows, Kangana holding a torch (flame) in her hand and her costars Ankita Lokhande, Unnatii Davara,Mishti Chakravarty and Priya Gamre, all dressed in full costume. The teaser of Manikarnika, was released yesterday with the viewers giving a good response Directed by Radha Krishna Jagarlamud and produced by Zee Studios and Kamal Jain, Manikarnika is releasing on 25th January, 2019.